Set over two generous levels, this carefully crafted resort style home speaks 'oasis' at every turn. Completely rebuilt in 2012, the entire upper level is dedicated to entertaining. Open plan at first glance but cleverly designed to partition off into the spaces you need, when you need them. The home automation system sets up movie night on the big screen at the touch of a button, or creates the perfect LED ambiance for entertaining in the over sized dining space, kitchen and outdoor deck. 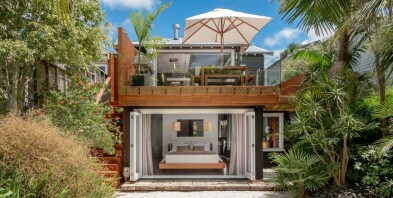 Warm Auckland nights elevated on the deck surrounded by the lush Balinese style garden evoke a heady sense of sundowners at your favourite holiday spot - something rarely achieved on the city fringe. That holiday at home feel is further enhanced on the lower level. Beautifully proportioned and with three of the four bedrooms having their own private external access, the master suite rivals the coolest of Balinese villa suites. Resort style living at its best - pour a cool drink at the bar or wine from the cellar, step down into the dressing room and open air bath, then enjoy absolute privacy from your built in bed complete with hidden TV. Fully air-conditioned and complimented by extensive underfloor heating, absolutely every luxury has been catered for. An exceptionally special home our vendors have crafted in a masterful way. The extensive chattels list supports extraordinary attention to detail and a genuine desire to present a complete offering to the market. Simply incomparable and essential viewing.